It was the last weekend in October when our Super Mario look-a-like plumber commissioned the gas and we let water flow through our new central heating system for the first time. There was the odd leak, always to be expected, but they were soon fixed and since then we have been enjoying a cosy warm house and mega powerful showers. Dom has done such an excellent job - I'm very impressed! Our next task is to replace the entire downstairs ceiling, but before we pull it down we are testing out the placement of our lighting. We have decided on dimmable tilting downlighters for the kitchen, the same in the living room plus a funky standing lamp and three pendants hanging over the dining table. Pretty standard fare for the times I suppose. Once the ceiling and lighting are in place, the rest of the work is relatively cosmetic. 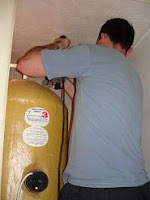 Dom had to move the old water tank to give him space in the cupboard to work on the boiler. This tank is no longer needed because we have a combi-boiler. In the photo on the right, Dom is drilling a big hole for the flue. 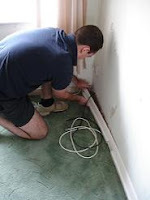 We decided to hide the pipework behind the skirting board, so it had to be removed. 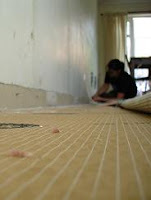 Dom started me off, then I used a plasterboard saw to cut, at skirting level, along the length of the wall. 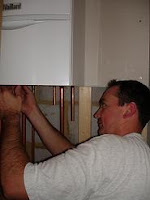 On the left Dom is working on all the connecting pipes into our new Vaillant boiler. These will be hidden behind plasterboard to make the inside of the storage cupboard neat. 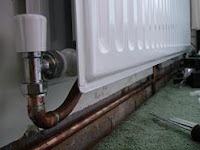 On the right is an example of the downstairs hidden radiator pipework. From the front the radiators look like they are floating. We still need to paint the pipes and put new skirting on.